Born in 1954 and raised on Southern California horse ranches, he has worked and lived the life of his artistic subjects and can speak the language of his experience. The ability to recreate a sense of place and time doesn’t come easily. Most collectors do not realize that DeMott spends hours researching and studying tools, wardrobe, accoutrements and the history of his subjects to recreate the detail that is a trademark of a Demott painting. The Plains Indians, the trapper, cowboys, a grizzly bear in the wilderness or simply the beautiful southwestern landscape, it is DeMott’s gift that can make the viewer keenly aware of sense of time and place. 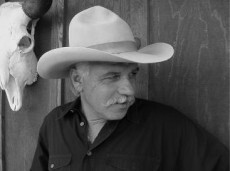 John’s work has been published in the following art publications: Art of the West, Southwest Art, Art Talk, Civil War Art, Sporting Classics, and Western Horseman.